Size: Hoplolichoides is 2.6 inches long! This is an extremely displayable plate of Russian trilobites. It is a spectacular Hoplolichoides furcifer and a flying Neoasaphus cornutus from St. Petersburg, Russia. 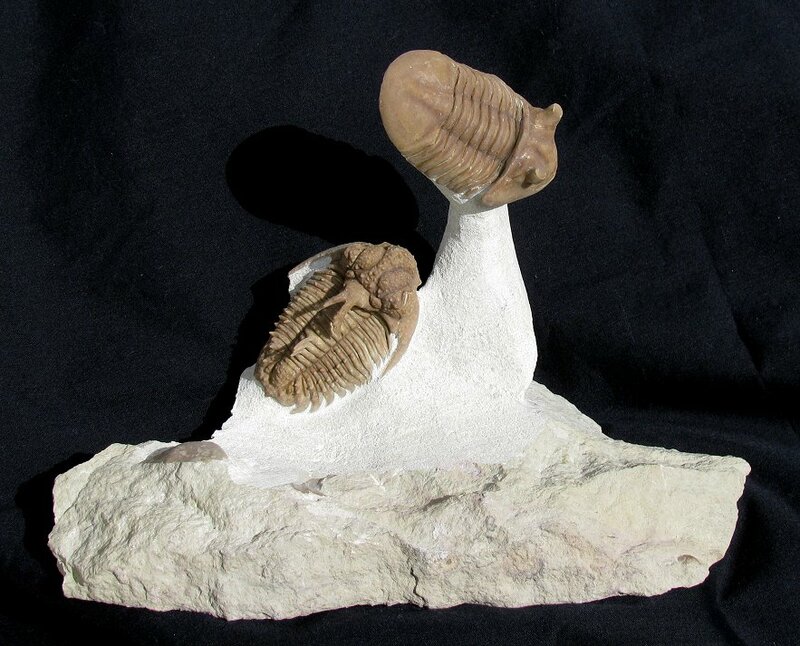 Hoplolichoides is one of the rarer and more sought-after types of trilobites from Russia, and it is a beauty! The bug is incredibly complete, wonderfully articulated, and fully outstretched. The HUGE Hoplolichoides has been prepared with the horns and body spines free-standing. The thick shell exoskeleton is covered with large pustules and tiny spines. Also, the entire Neoasaphus cornutus has been prepared free-standing, and it looks like it is floating above the rock! And the hypostomas (mouthplates) are even fully exposed on both trilobites! This specimen is simply as good as it gets. It is easily one of the most displayable trilobite plates from Russia we have seen.